We try to have regularly scheduled charity sewing days on Saturdays and aim for once a month when we don’t have a workshop scheduled. Members also sew at home to contribute to our selected causes. In 2019, members voted to support three organizations that support children. Crossroads – we will be making quilts for children and youth aged 4-14 who have experienced sexual assault. Prior to a medical exam, children will be able to select a quilt for comfort and to take home. Ryan’s Cases for Smiles – we will be sewing pillowcases that will be distributed to hospitalized children in several hospitals in the Raleigh and Winston Salem areas. Carolina Adoption Services – We will be continuing to create quilt blocks to welcome adopted children “home” through domestic adoptions and international adoptions. See adoptee quilt photos. In 2019, we also donated quilts to Davis Street Methodist Church for their newly remodeled nursery and toddler rooms. We are very appreciative of the church for providing us a place to meet. During 2017 we began making quilts to contribute to NALES for children who have lost a parent in law enforcement. In 2018, we made an all-out commitment to NALES and our members donated 46 quilts in October 2018. Some of these were a result of our 2018 President’s Challenge. Photos of September 2017 donations to NALES. One of our projects for 2019 is to sew walker bags for those living in retirement centers, starting with Alamance House. During fall of 2017, we worked with the memory care unit of Twin Lakes to sew clothing protectors from fabric and a pattern donated by a resident’s family member. Several guild members also created fidget mats for memory care patients. A dozen clothing protectors and five fidget mats were delivered for use by residents. See photos of Twin Lakes donations. Lap quilts made by guild members were donated in December 2017 to Davis Street Methodist Church in appreciation for their allowing us to use their facilities for our meetings and sew days. Group members sewed adult bibs that were donated to Brookdale Clare Bridge Alzheimer/Dementa Care Unit at the end of 2016. 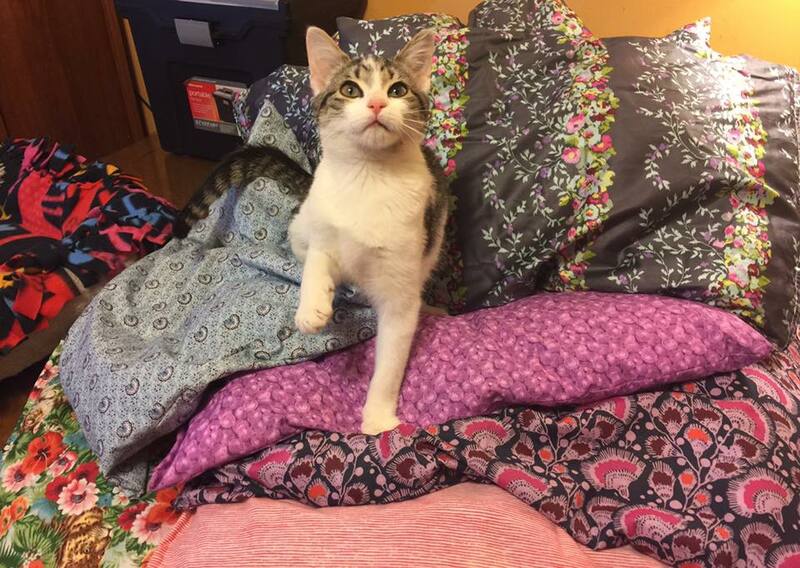 Members of our group save their fabric scraps and use them to stuff pillows for cats awaiting adoption. They are donated on a regular basis to Sparkle Cat Rescue. The list below includes already established charities, ideas for projects, and instructions. Project Linus – blankets for seriously ill children ages 0-18.